March | 2015 | ARTZCOOL'S BLOG! We were having a potluck lunch at work, and I signed up for dessert thinking that I would spend some time on Pinterest, and find an impressive and delicious, yet surprisingly easy home baked dessert to make. But by the night before the potluck, on my way driving home, I realized that I had no idea what to make. So, in order to avoid having to make an additional trip out to the grocery store, I decided to stop on the way home. After a quick trip down the baking aisle, I decided that I was going to find some stuff to dip in chocolate. Quick, easy, and delicious… How can you go wrong dipping stuff in chocolate? So, I picked up some two bite brownies, Oreo cookies, pretzels, and twizzlers. I melted some chocolate in my double broiler (or my Pyrex bowl that fits over my sauce pan, but double broiler sounds better) I have tried numerous times to melt chocolate right in the sauce pan, but every time I try, it cooks too fast, and goes clumpy, or seizes. So, I filled a saucepan 3/4 the way full with hot water then put a bowl on top, and melted the chocolate in there. I did the dipping, and Sam was my sprinkles girl. We dipped a bunch of twizzlers , pretzel sticks, and I still had a lot of leftover chocolate, so I dug up some more pretzels, and kept on dipping until I scraped the bowl clean. I almost forgot to mention that you should use parchment paper on a cookie sheet to make sure the chocolate doesn’t stick. The chocolate comes right off, and I even can reuse the paper a couple times for stuff like chocolate dipping. ﻿﻿When I finally used up all of that chocolate, I melted some white chocolate chips, and dipped the brownies and Oreo cookies. It actually was pretty easy to do when you are only dipping half of the cookie and you have something to hold on to. I let each cookie sheet cool in the fridge for about an hour before trying to move them. ﻿﻿I put them all on a fancy tray, and voila, instant dessert. Considering by the end of lunch, there were no leftovers, I think they went over pretty well. ﻿﻿Plus, I had some extra pretzels that I just couldn’t fit on the platter, that we had to eat. Easy peasy! The neat part about these are that you can change the sprinkles according to the season. Red and green sprinkles for Christmas, orange for Halloween, etc. Maple syrup…Step One! Don’t be Sappy! I have been waiting for the weather to warm up, because you can’t tap the trees until the day time temperatures are above freezing. But, now finally, we have had a few days in a row where the temperature is above freezing! ﻿﻿ As you can see in the above photo, I also bought a plastic tube, thinking that I might be able to use that as a tap as well, but I didn’t end up using the plastic ones. We have two sugar maple trees in the front of our house, and two silver maple trees in the back. I did actually (surprisingly) do a bit of research on tree identification before I started. My plan was to collect sap from one tree in the front, and one in the back. Here is a picture sam took of the trees in our backyard. The process is actually pretty easy to collect the sap. About three feet up, drill a hole 2-3 inches deep. I used a 7/16 drill bit. I hope no one comes along and steals our sap! I think all of our neighbours already think I am crazy, so I’m not worried about that, but I’m thinking I might put a Please Do Not Touch sign on it…. Anyways, we went to the mall to pick up a present for a birthday party Sam had this afternoon, and by the time we got back, we had a couple inches of sap at the bottom of the bucket! It’s pretty cool, it looks just like water. The kids and I decided we want to try a little bit of the sap to see what it tastes like. I read online that you should boil it for about a minute before you drink it. I’ll give you a syrup update as soon as I can to let you know how the next part of our syrup making journey goes! So I have been busy lately, but not so much making stuff in the past week…I have been working on clearing out the basement and dining room, and front room and closets… I have been donating and selling lots of online on Kijiji, and the local Facebook buy and sell pages. 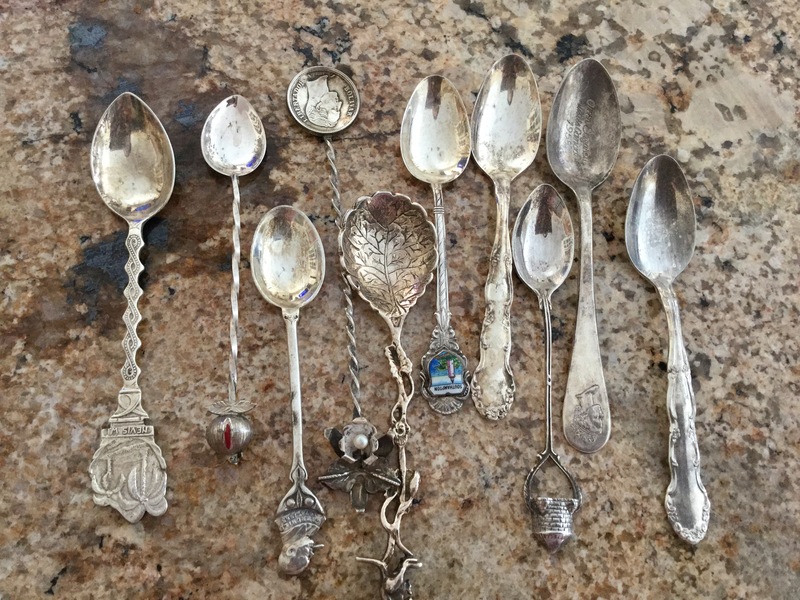 In my quest to clean out the dining room, I came across a bunch of silver spoons. They were pretty tarnished, so whether I keep them or not, they need a clean. Here’s what they looked like before. 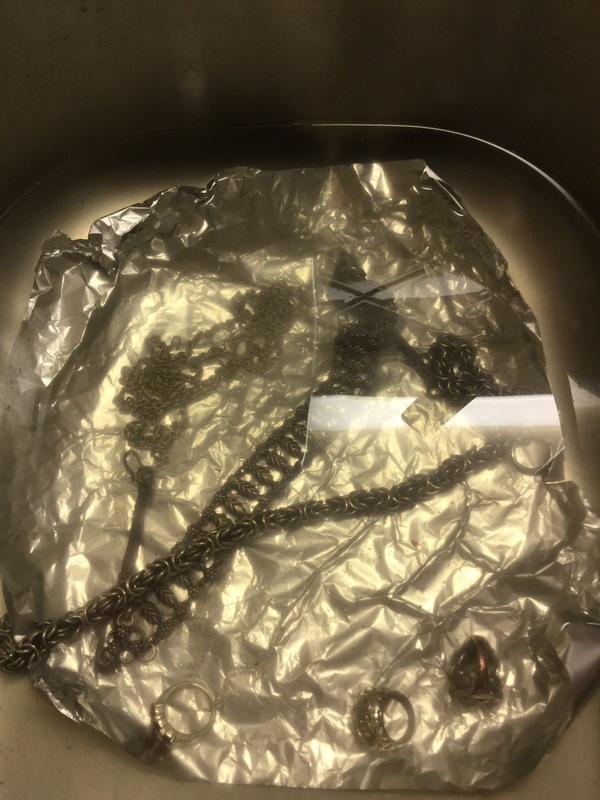 So I guess you can’t see from the picture, but a few of them are solid silver, and a few are nickel plated and electro plated. I didn’t want to use a silver cleaner because I didn’t want to take off the plating. 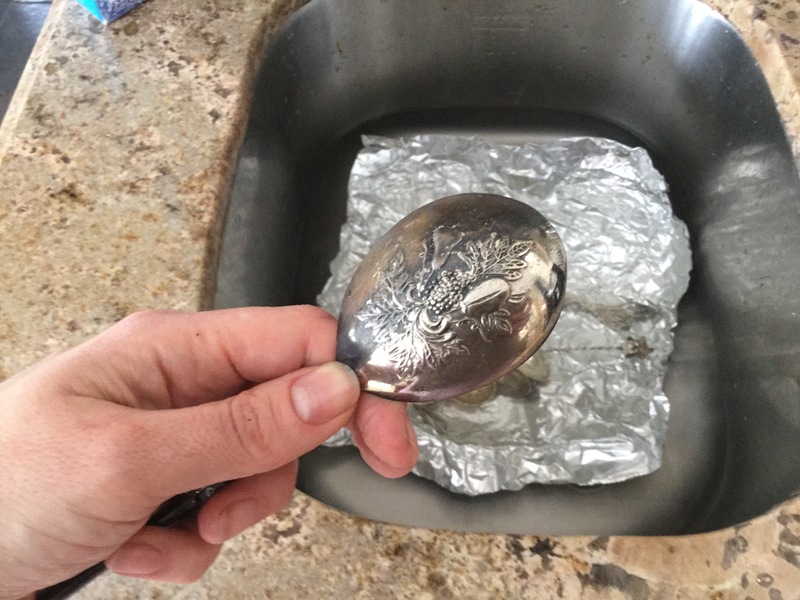 So I did a little research and found that if you use a few cups of hot water, a couple tablespoons of water softener (I used Calgon), and a piece of tin foil, it was supposed to safety clean silver. So I filled the sink with hot, hot water. 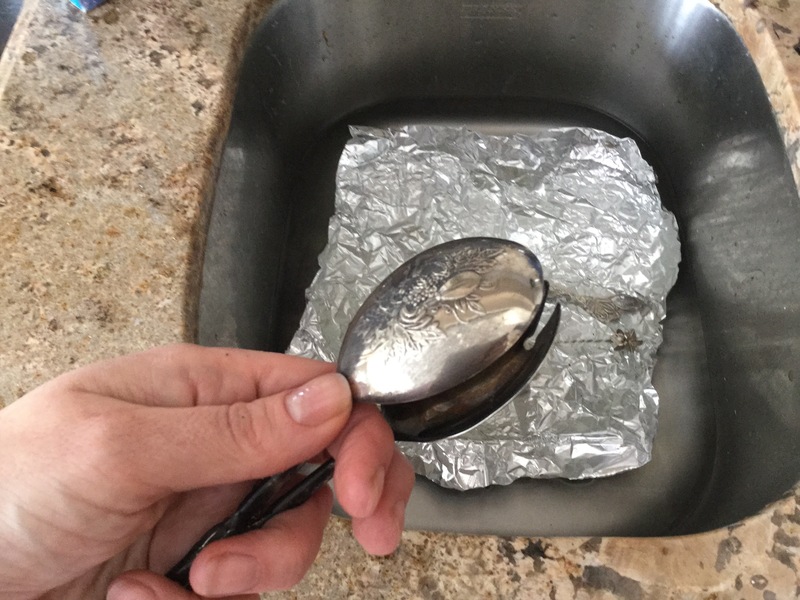 Then, lined the bottom with tinfoil, and added a couple tablespoons of Calgon. Can you see the half that was submerged? 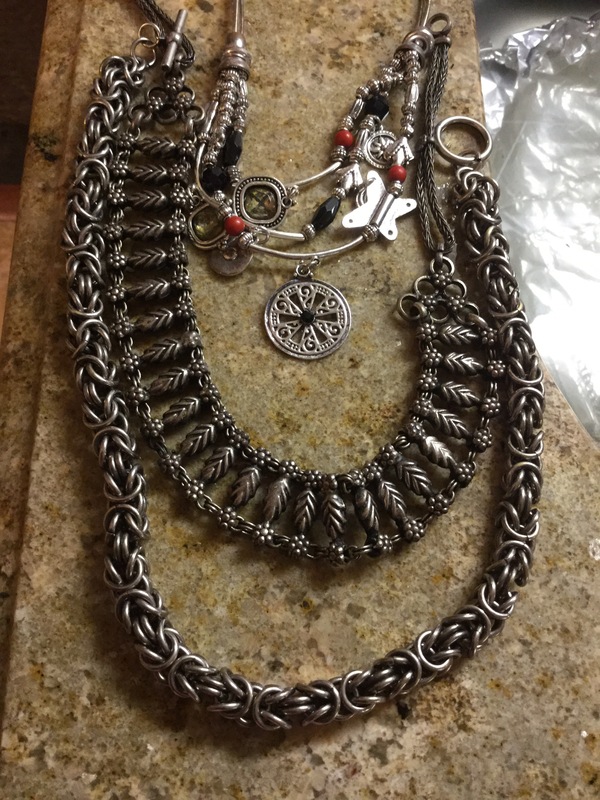 So, of course, I dug through some of my jewelery, and found a few things that needed a little polishing…. The results were not quite as dramatic as the silverware, but they did shine up nicely. But, the great thing was that it required very little polishing. I did wipe them down with a cotton cloth, after soaking, but I didn’t have to scrub at all. There were a couple of the pieces that I had to put into soak for a few extra minutes, but they cleaned up pretty well. 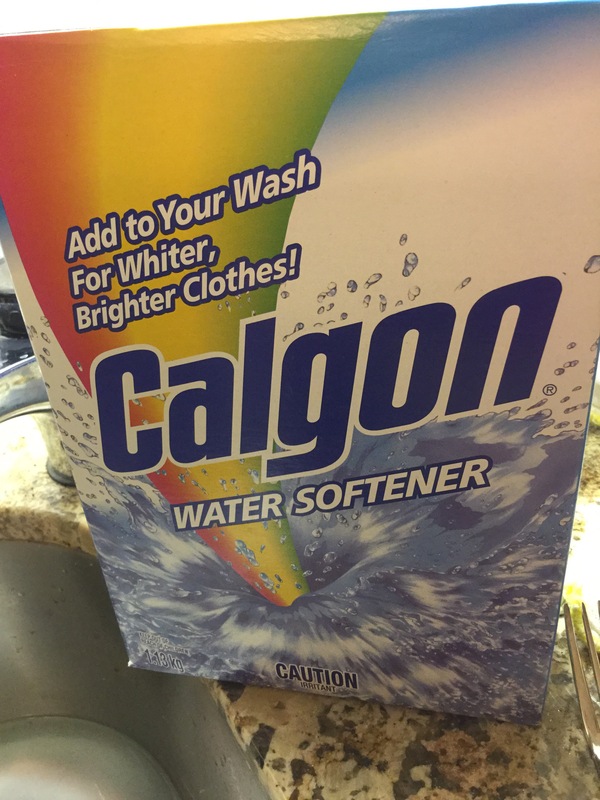 The thing is that I now have a whole box of Calgon water softener leftover! What do I do with all of that water softener? 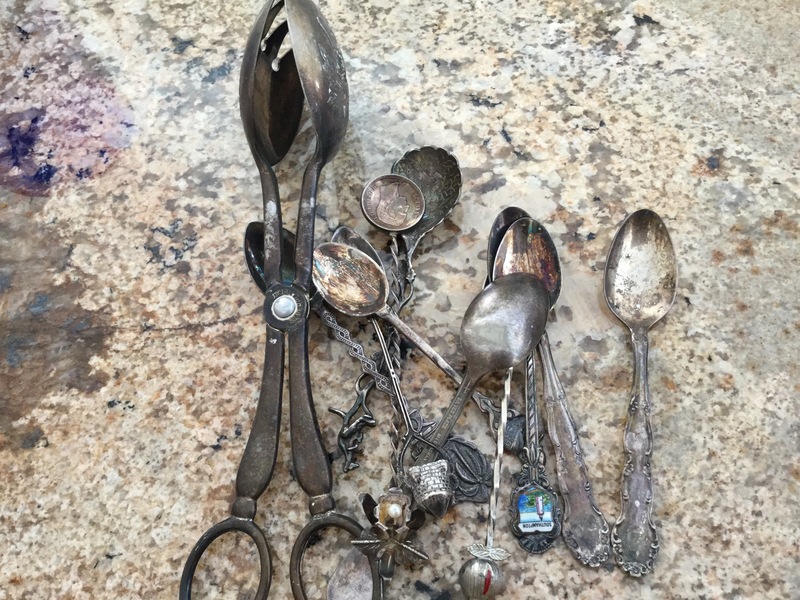 If anyone close to me wants to clean some silver I would be happy to share!